I have stored all my account details for every site I've ever signed up on, 270 in total, and couldn't live without KeePass to help me keep track all usernames and passes. It's a joy to log in to a site and have it to auto-type required info simply by using a hotkey. User friendly and light-weight. It has a clever password generator tool, etc.. Bust most importantly it's SAFE, everything is locked with a master password. You can export the entire database to make backups, or if you want to use on other devices. i've been using keepass for years. so to this end, i can't really complain about anything with the program, other than importing is tedious. ron_marz: that's a stupid reason to rate the software low. There is also a portable version that doesn't require .Net, runs fomr USB key, etc... you are, therefore, stupid. Moving on. It's fast, extremely effective, as stated can be portable, and flexible. Strong, solid 5 for this one. @anomoly...enlighten me...have you even tried Keepass....UPM is like a "hello world" written by a high school kid....hmmm...are you a HS kid btw ? Simply the best password manager. Maybe too many features for most people. Does everything i can think of and i can run a version of it on Android. Anomoly> UPM is a lightwieght - no feature manager. It doesn't compare with this. 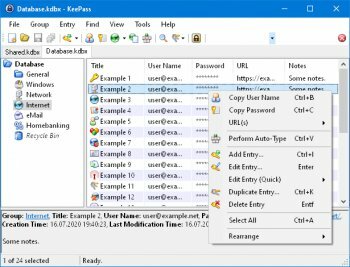 There are KeePass ports to every OS and phone you can think of. The greatest password protecting program ever written. "requires .NET"... oh, come on!!! That really is NO reason for a low rating! .NET 2.0 is like "part of the OS" by now, so there's no longer need for extra installing the runtime (other like i.e. Java-based applications). "used only by lazy programmers"??? Yeah, right... I'd better say by productive programmers, since Visual Studio is a great IDE. Furthermore .NET apps are MUCH safer than i.e. pure C++ (buffer overflows, pointers etc). And I guess you won't count Java-programmers "lazy", would you? Anyway: KeyPass v2 is great, love the UI and simplicity. And regarding portability: there Is a portable version (yeees, requires .NET runtime on the PC, yada-yada). Though I agree that MOBILE KeePasses (Android, Java) only support v1 databases. Still... it's the best. 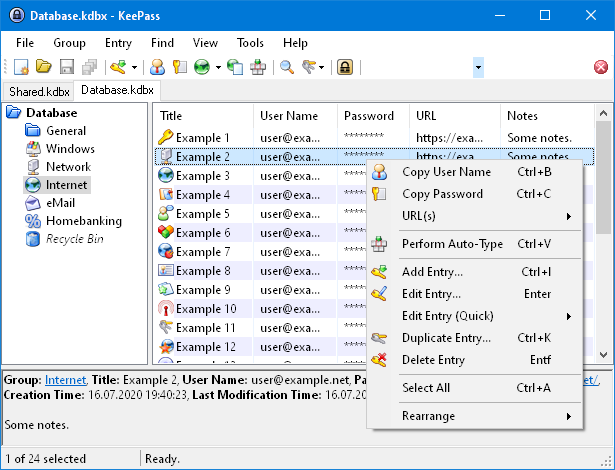 KeePass is a superb password manager. It now offers 2-channel auto-type obfuscation, to enhance the SAFE entry of private information (logins, passwords, user name, banking, etc). This feature is especially important if you want to defend against keyloggers stealing private information. Requires .Net Framework, and thus is no longer portable, but can only be run on other systems also saddled with an extra gigabyte of sloggy bloat. Such an excellent tool. Really changed how I manage security both professionally and personally.